With Monster Hunter Generations you have a brand new adventure for your hand held game console NDS. The game features many known aspects of its predecessors and the game offers you not only an enormous arsenal of different weapons, but they are also classified into very versatile categories. Which of blades and guns are particularly strong, we show you in the individual areas. Some of them have elementary bonuses, base stations or just really good damage. In this guide we show you the best five weapon of each category. With large swords you will probably not strike very often. Therefore, it is important that your attack on level three and then lands a targeted hit with a lot of damage. Overall, there is a very large number of swords, so it is quite possible that a great sword, which we don’t carry in our list, better suits your style of play and thereby considerably stronger. 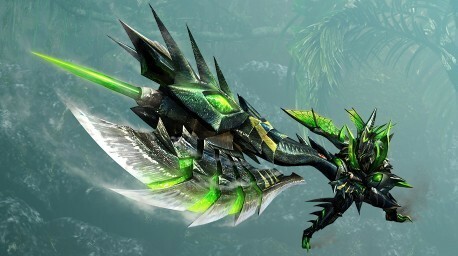 Try out and get to know the appropriate weapon for your Monster Hunter. Lances give you a very good range, with good defense. The Gunlances are an interesting mix of normal lances and firearms. The hunting horns can provide you both damage and support. With the melodies of hunting horns can strengthen your status values or immunite and even confuse monster. If you decide on the sword and shield variant in Monster Hunter Generations, you get a big defensive bonus at the expense of your damage output. They are very fast weapons and produces a lot of damage in a short time. Although suffers your defense, but you are very mobile and can dodge attacks well. With these heavy weapons you can knock your opponents. You caused much damage, but very slowly. You have a huge reach and can thereby distribute much critical damage while you can switch between the ax and sword mode. With these weapons you can additionally boots your attacks. This will get you a good bonus to your damage and are still protected by your shield from harm. You can attack with the blade of your Insect Glaive and also chase an insect on the monsters. By severe variant of Bowgun your movement speed is somewhat limited. But the shots of Heavy Bowgun have tons of punch. Pay attention to the critical distance. If you too far away from your destination, your damage will suffer. Try the correct range to find in order to make the most of your weapon.